Hardwood is a flooring option that stands out in residential and commercial spaces. This type of flooring has appealing characteristics and is usually made from timber. Many people select hardwood floors because it’s available in a variety of colors and styles. Besides these perks, there are many other great reasons why hardwood floors are featured in thousands of homes and buildings throughout the United States. In many neighborhoods where elegant homes are found, strategic builders construct new houses with wood flooring because a wood floor plan increases property value. When potential home buyers step into a home, the first thing that they notice is the flooring. If a floor is clean and shiny, they’ll want to explore every space and each nook and cranny. Another key benefit is that wood flooring is simple to maintain. If dust generates on the wooden surfaces, you can remove it with a traditional broom or a dust mop. Carpets and hardwood floors are very stylish in a home; however, a wood floor provides more practical advantages. For example, after a carpet is placed in a home, people will track dirt on the fibers as they walk through various areas. As heavy dirt builds up on a carpet, the color of the material will darken, and the only way to make a carpet dirty look appealing and tidy is by shampooing it. If you don’t want to buy or rent a carpet shampoo machine regularly in order to maintain clean carpets, you’ll benefit from installing wood flooring. When dirt generates on hardwood floors, it doesn’t adhere to the surfaces. As a result, you can remove light and heavy dirt effortlessly without using shampoo, water, and costly cleaning equipment. When hardwood floors are installed, everyone notices it’s unique, classy characteristics. The main elements that make a wood floor stand out are the grains. Every piece of timber has a unique grain pattern that features straight, curvy, and swirly lines. These characteristics will vary based on the age of a piece of timber. Typically, the oldest timber slabs always have the most detailed grains as many patterns form and develop as the material ages. Wooden floors are tough because the materials don’t react to the hot temperatures in a dramatic way. For example, in humid climates, engineered hardwood handles the heat very well. As the temperature drops in a muggy environment, a slab of timber doesn’t expand or shrink. Because the size of timber doesn’t change, a traditional hardwood floor can’t warp. If needed, you can take an interior design to the next level by arranging area rugs in key areas. Modern area rugs stand out in a space since they have trendy patterns with multiple colors that doesn’t clash with hardwood floors. Contact Brucke Flooring in Tulsa, Oklahoma today and let our capable and knowledgeable staff assist you. 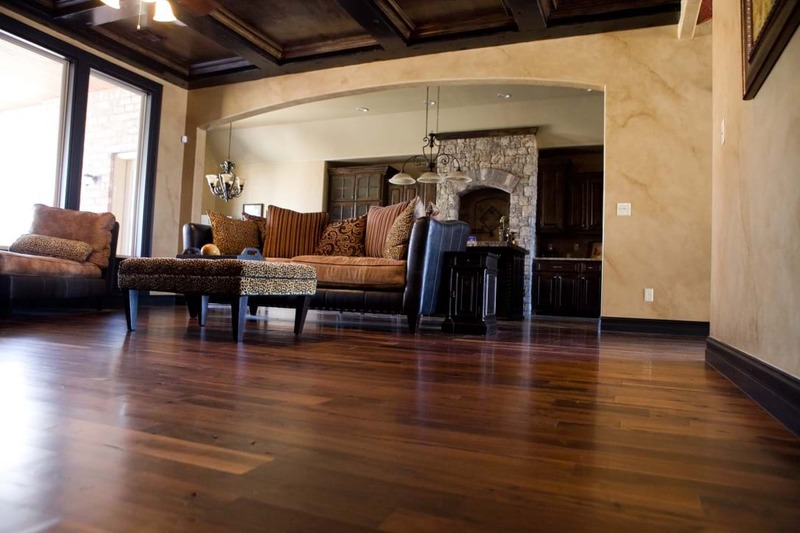 Brucke Flooring prioritizes the highest quality hardwood flooring. If your home is in need of professional hardwood flooring services, contact Brücke Hardwood Flooring in Tulsa, Oklahoma today!